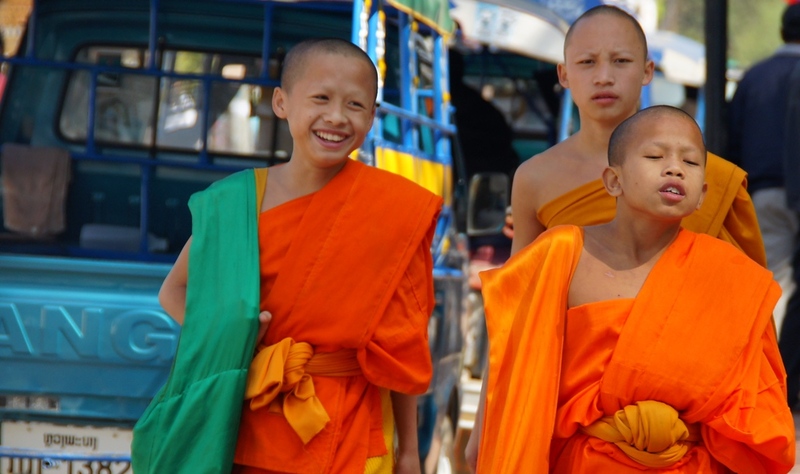 These two young monks share a laugh as they walk down a quiet street in Luang Prabang, Laos. 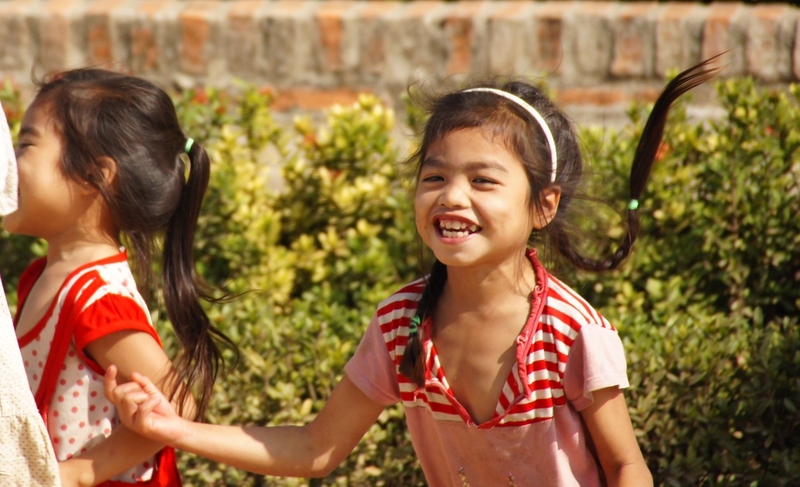 These cute children enjoy a moment of play together as they smile and laugh out loud – Luang Prabang, Laos. 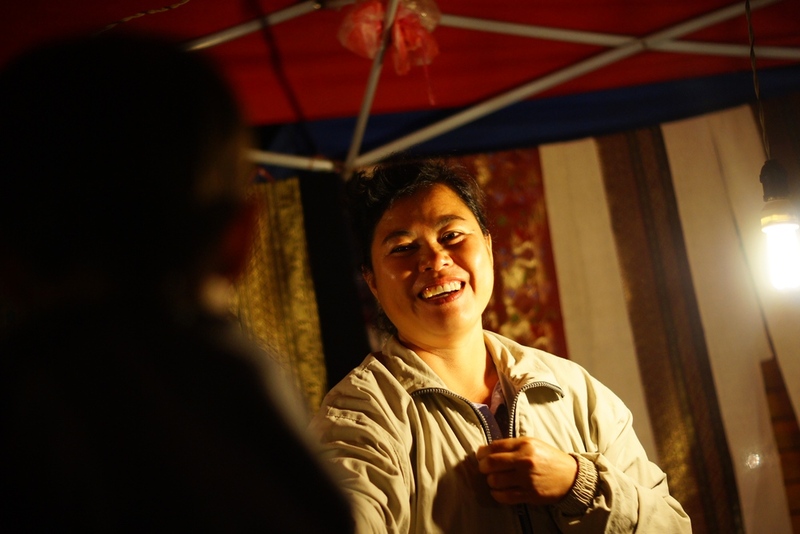 A friendly Laos vendor at the night market in Luang Prabang, Laos. A cute family portrait is slightly off kilter by the motorbike this is zooming on past. 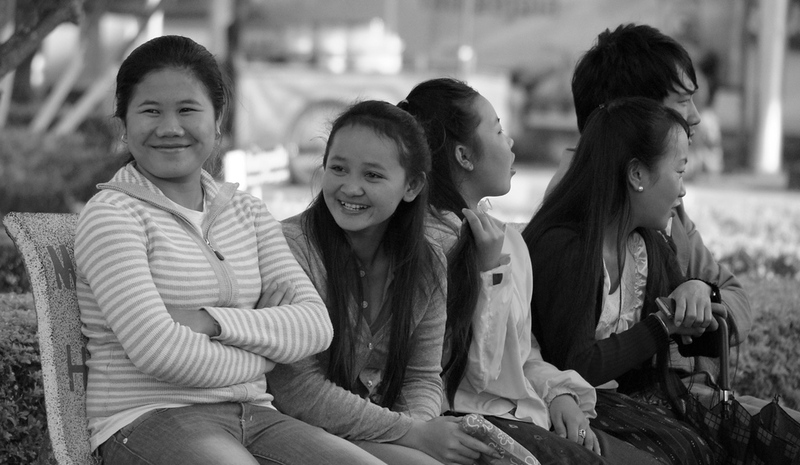 Some Laos ladies stare at a photography and giggle together. This is one of my favourite photos. 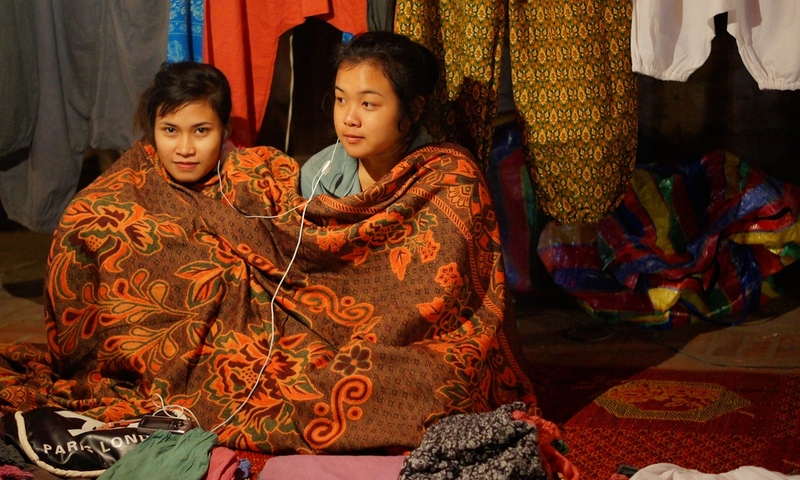 As the night market was about to close these two vendors sat together and shared some music on their mp3 player. 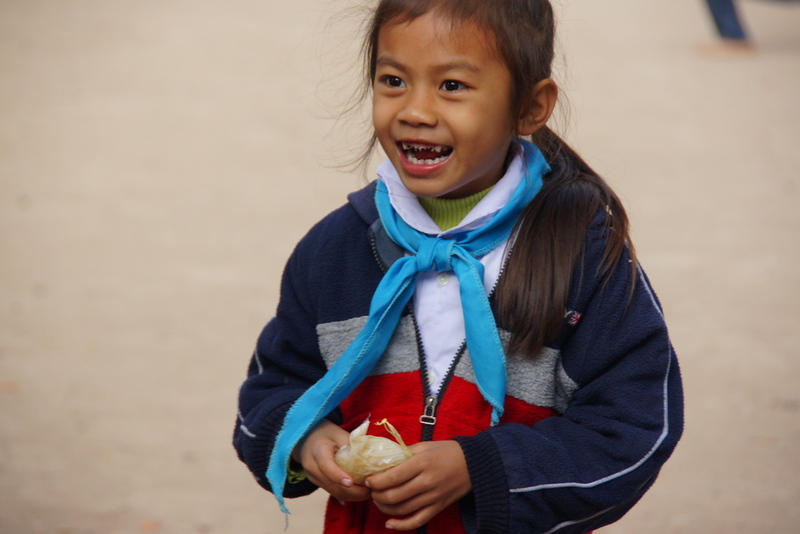 A cute Laos child plays in the school yard. 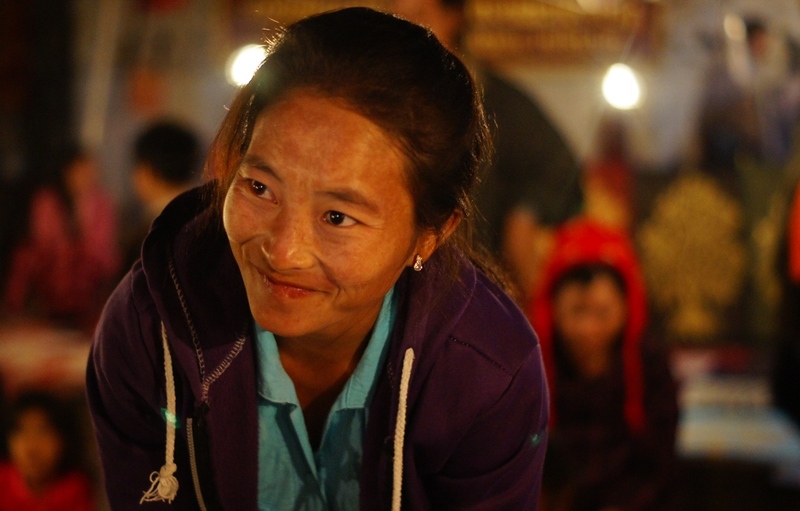 A Laos vendor smiles during a transaction with her customer. 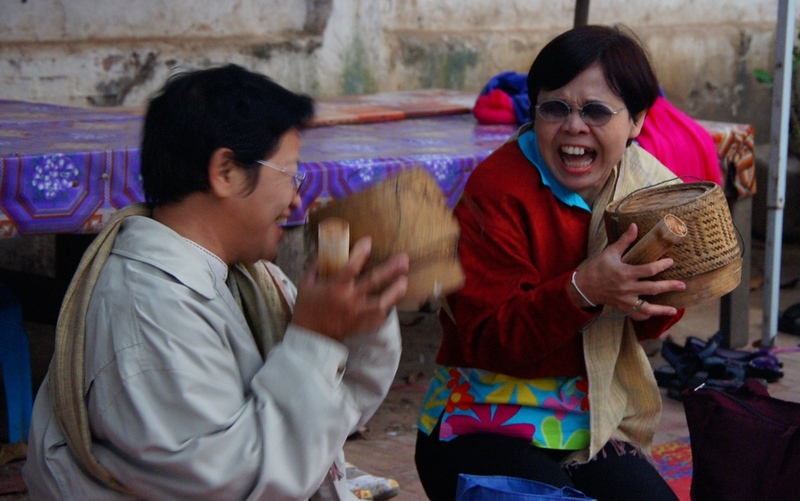 These two laugh hysterically as they shake the alms they are about to present to the monks. 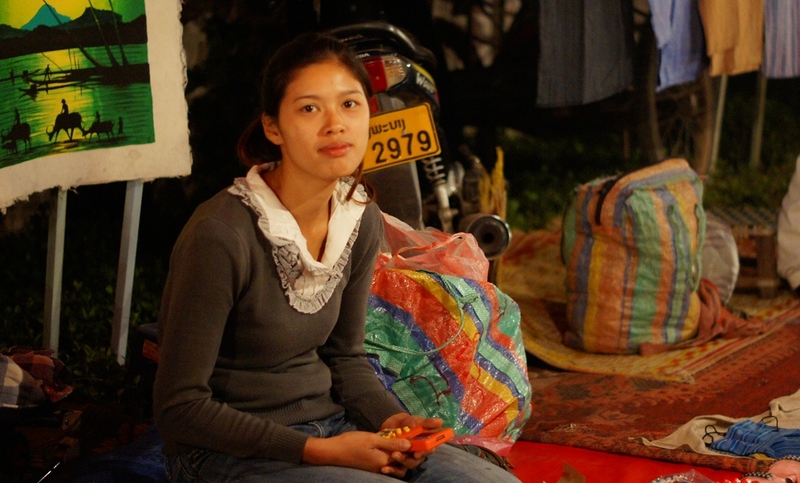 A Laos lady with a bit of a lonely smile sits patiently waiting for a customer at the night market. 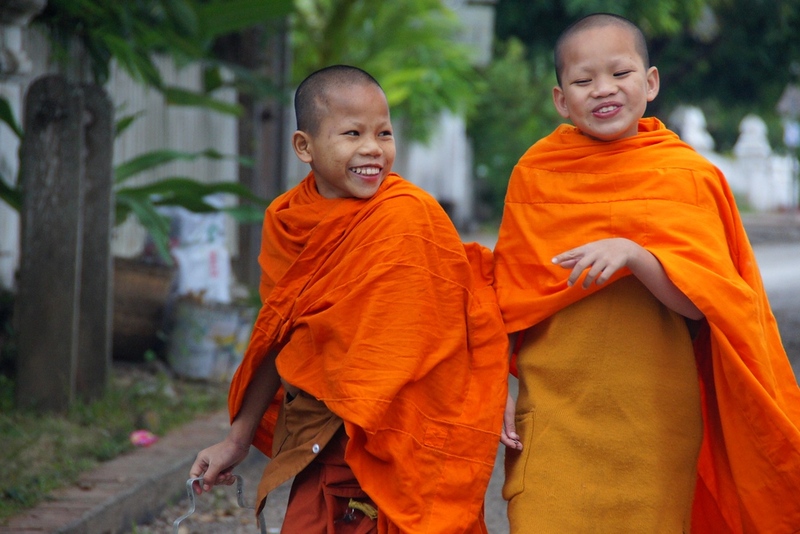 These two smiles in anticipation of the Alms giving. A young friendly vendor with a genuine smile. This lady appears to be ecstatic over what is happening during the Alms Giving ceremony. 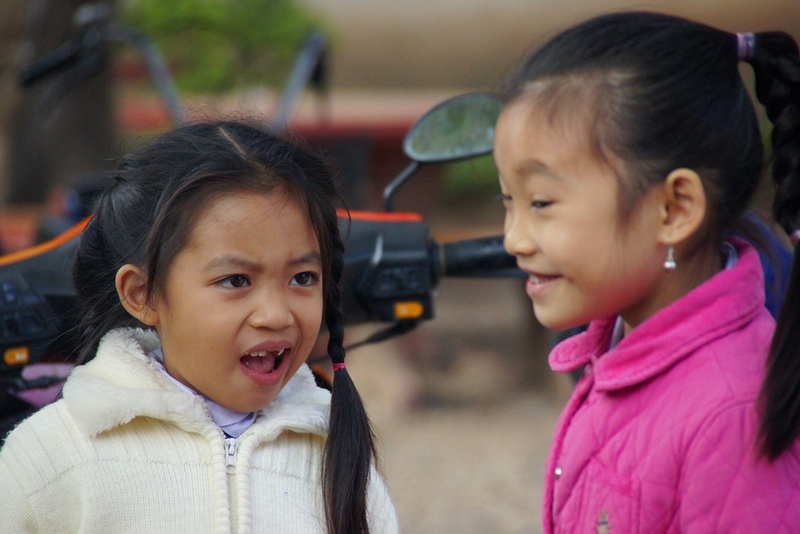 Two cute girls with very different facial expressions. 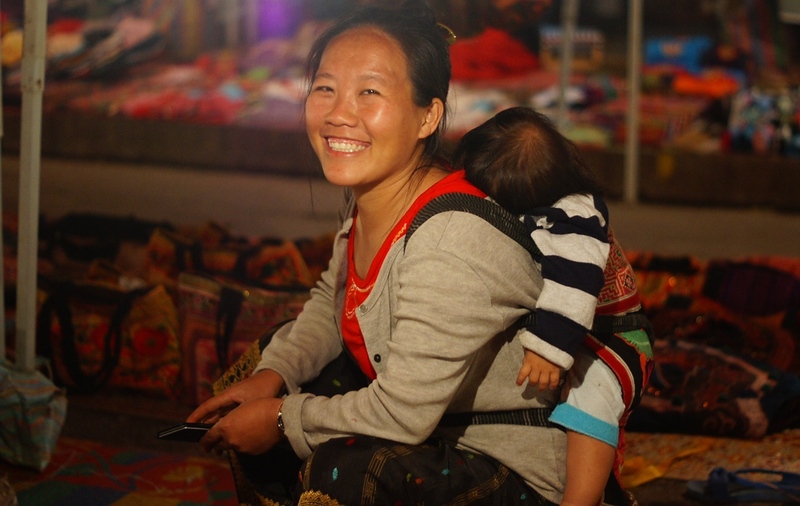 A lovely lady smiles with her baby on her back. 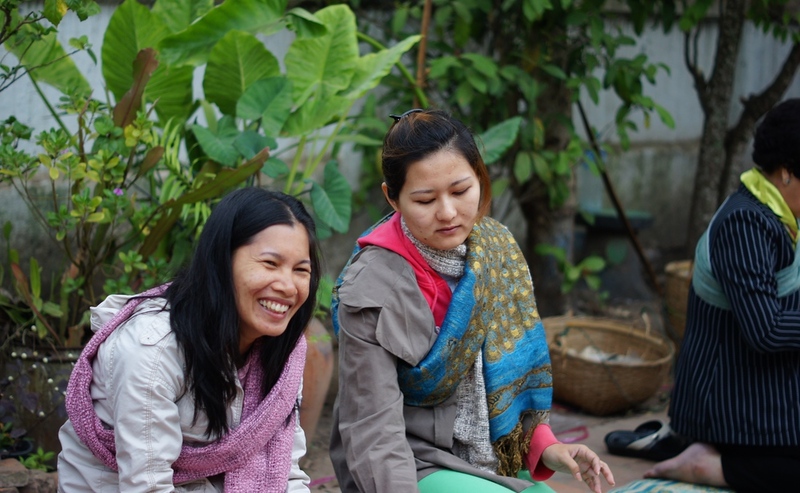 A group of ladies sit down and enjoy a smiling moment together. A cute smiling pose from a happy couple. Even though I’ve “stumbled upon” this one before, it was just as good the second time. Maybe I should just bookmark it and start EVERY day with a smile. Thank you! 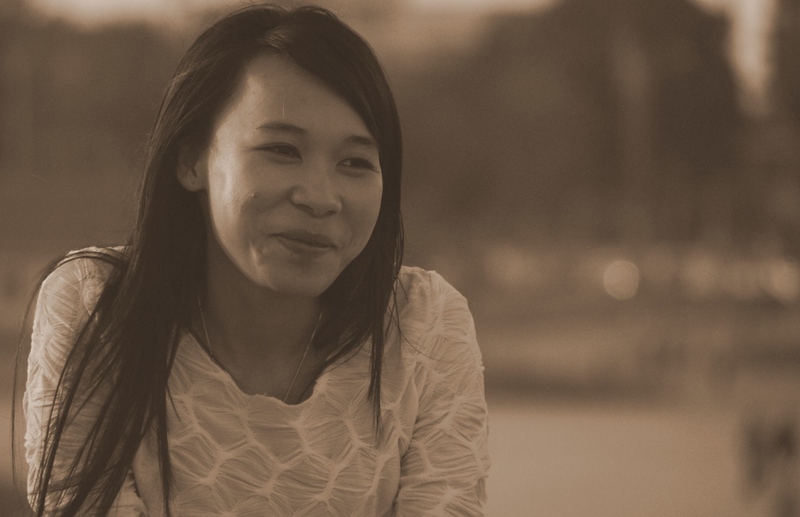 I have just started working in Laos, and I can say the people are fantastic. All smiles and they are always relaxed. Of course, this can also make it mind-bogglingly frustrating to get things done, but their moods are contagious. Great series of posts, keep it up! Thanks for putting this series together. Such pleasant, wordless moments. Fantastic, don’t know how I missed this, but luckily A Dangerous Business sent me here. I’m a pretty new blogger too, and and amazed by your success. Congratulations. Remember to keep having fun! Great photos. 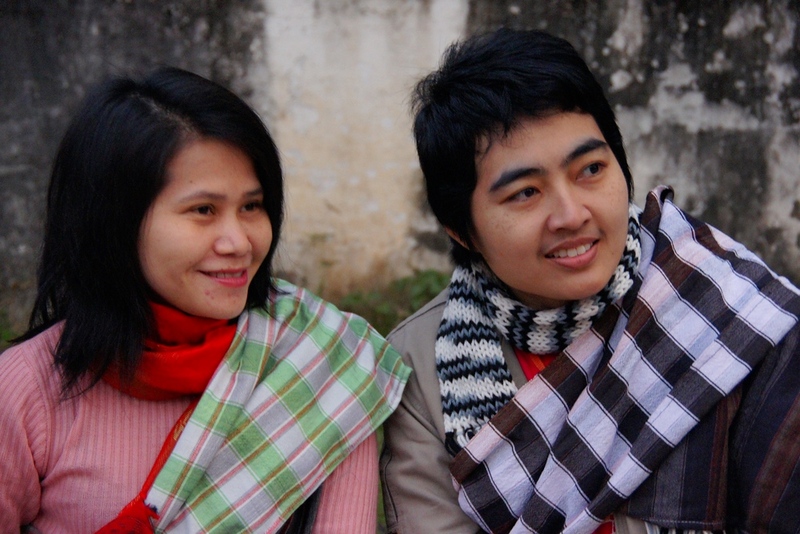 I loved Laos for that, people were so friendly and smiling a lot. Jarmo, that’s definitely true! The people are very warm and accommodating. Great collection of candids. I like this series on smiles. Lot of misery in some of these places, but not in these peope (at least in that moment). Kris, that’s very true. Some countries where I would expect people to possibly be dreary are in fact the opposite. Stunning photos! I love the colors! Great photo portraits! This reminds me of my visit to Laos during my RTW trip. Overall, the people were very friendly and helpful. More great shots mate. Love your work. I like the little girl with the black teeth. She reminds me of when I was a little girl with my silver teeth that I loved to show off to everyone. Very cute photos. And, I agree… this should be a series. A lot of these smiles have such a genuine and truth to them. These photos are all beautiful. Thanks Kita, I really appreciate you saying that. It’s a very cool country to visit. You totally need to turn this series into a book – “Smiles around the world.” Would be a great, oversized coffee table book. Think about it..